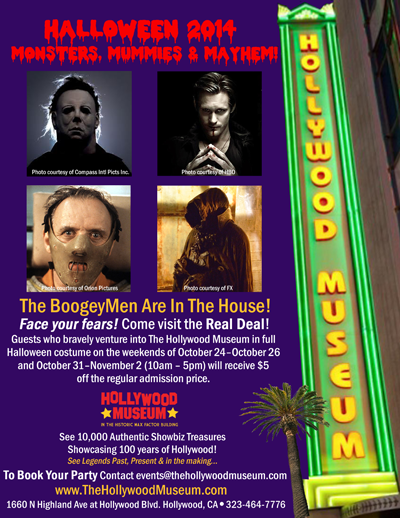 Hollwood Gothique unravels the mummies hiding within the Hollywood Museum's Dungeon of Doom. Los Angeles is somewhat deficient in year-round horror-themed attractions. We have nothing equivalent to the San Francisco Dungeon, so we have to be content with sub-sections of other attractions, such as the Chamber of Horrors in the Hollywood Wax Museum (reviewed here) or the House of Horrors at Universal Studios Hollywood (which recently closed). Fortunately, Hollywood Gothique recently discovered another such outre entertainment, the Dungeon of Doom in the basement of the Hollywood Museum. As befits its location inside the old Max Factor Building near the intersection of Hollywood and Highland, the Hollywood Museum is predominantly focused on glamour and beauty. Its extensive exhibits, spread among numerous rooms on four different floors, are filled with costumes, dressing rooms, vanity tables, and makeup kits - even a contract from MGM allowing the face of their star Jean Harlow to be used in Max Factor advertising. But step through the darkened doorway whose stairs lead down to the basement, and you leave the world of Marlene Dietrich and Marilyn Monroe behind, plunging instead into a dark, dank, and musty tomb, filled with the last remains of many Hollywood horror movies. Here you will find posters, sets, props, models, and mannequins representing myriad movie monsters and their victims. This dungeon of horrors is a ghoulish delight, but it is also a little bit educational, offering interesting factoids on the history of the genre. Currently on display in the Dungeon is "Monsters, Mummies, and Mayhem: Your Worst Nightmares Come to Life," which runs through November 19. 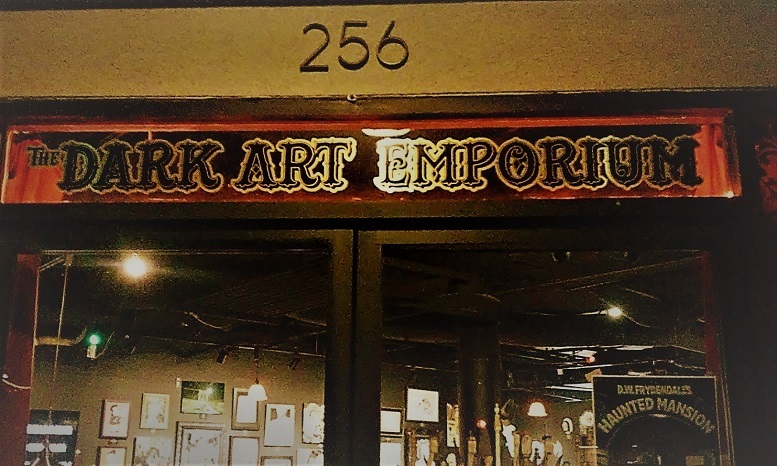 From our observations, this title seems to be mostly a matter of re-branding the Dungeon for the recent Halloween season; though some individual exhibits may rotate in and out, much of the display is permanent, such as the suite of rooms from Hannibal Lecter's prison in THE SILENCE OF THE LAMBS. The long corridor and individual cells are wonderfully convincing and tinged with just the right amount of low-key lighting. Lecter himself is not present, but his wardrobe is, including the famous face mask. Elsewhere, there is an impressive variety of exhibits, spanning the decades. 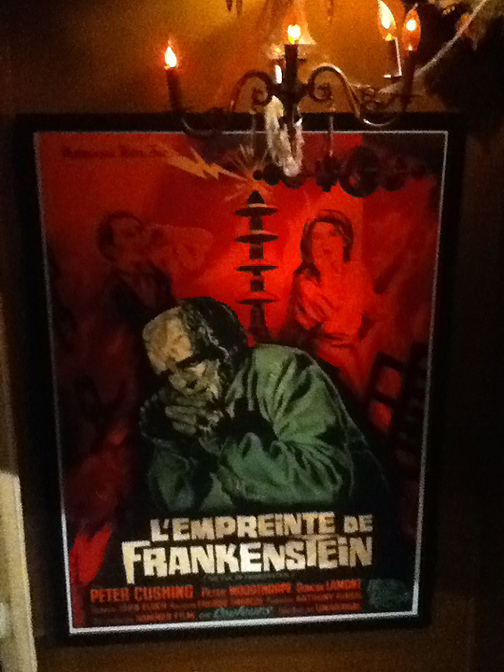 Displays from contemporary sources (television's Sleepy Hollow and Hemlock Grove) alternate with memorabilia from classic movie monsters (Frankenstein and King Kong). '70s and '80s slasher icons Michael Myers and Jason Voorhees stand shoulder-to-shoulder next to their more supernatural contemporary, Freddy Kruger. Further along are voluptuous mannequins representing seductive horror movie hostesses Vampira and Elvira (the latter of whom appears elsewhere in the museum). 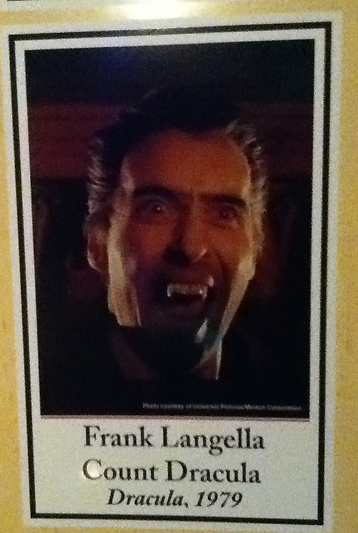 A caption misidentifies Christopher Lee as Frank Langella. Though Hollywood, U.S.A. is well represented, other countries are not ignored. 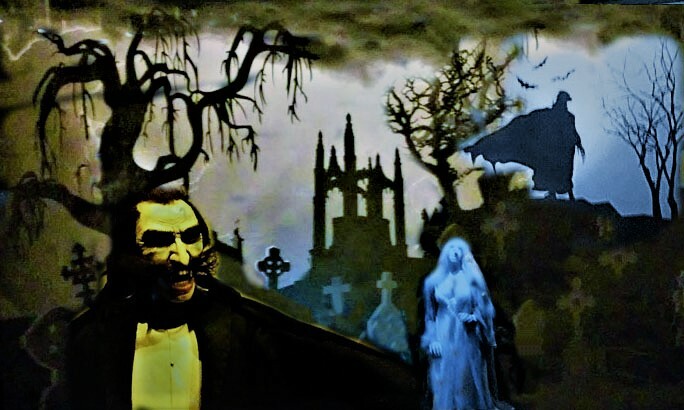 Posters from Britain's Hammer Films rub shoulders with their American equivalents: artwork from their 1961 version of The Phantom of the Opera stands amid costumes from the 2004 musical version; the poster from their 1971 production Blood From the Mummy's Tomb resides nearby a display for Universal's 1932 black-and-white film, The Mummy, starring Boris Karloff. There is an attempt to provide some historical context and information. Monitors screen behind-the-scenes clips from The Silence of the Lambs. Collections of photographs showcase famous examples of homicidal maniacs, scream queens, female vampires, and actors who have played Count Dracula, ranging from Max Schreck to Luke Evans, along with almost everyone else in between: Bela Lugosi, Lon Chaney Jr., John Carradine, Christopher Lee, Udo Keir, and Gary Oldman (though, in a notable mistake, Lee's image from Dracula, Prince of Darkness is reproduced twice, once correctly identified and then mis-identified as Frank Langella from the 1979 Dracula). After minutely perusing these strange exhibits in such close quarters, one may become sensitized to the oppressive miasma infusing the Dungeon. An ascent - for a breath of air and further exploration - is recommended. 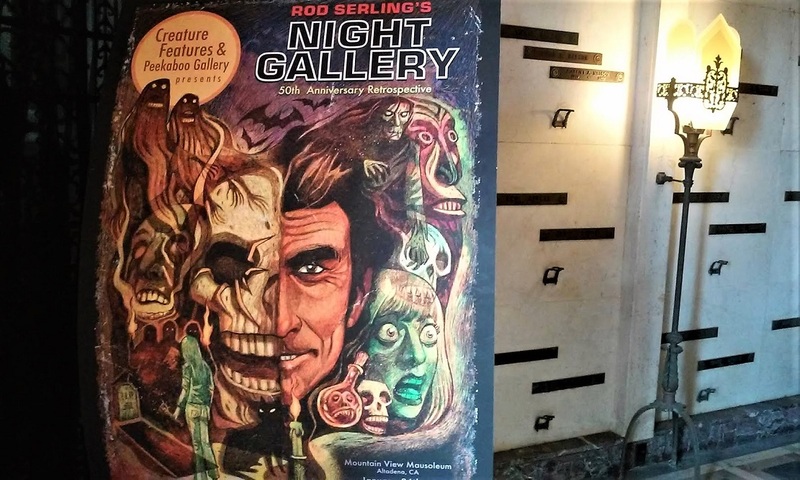 Though the more overtly horrific exhibits at the Hollywood Museum have been consigned to the Dungeon, the upper floors are not without items of interest to fans of mystery movies, fantasy films, sci-fi cinema, and Halloween horror. The first floor houses exhibits from The Last Starfighter; Monsters, Inc.; and Planet of the Apes. The latter includes a display of Cornelius and Zira from the 1968 original; nearby, the space capsule that transported Mark Wahlberg in the 2000 remake is nestled next to a cocoon from Cocoon. There is more to see upstairs. On the way you will pass an executive's office inhabited by an unidentified species of tiny ghoulies. 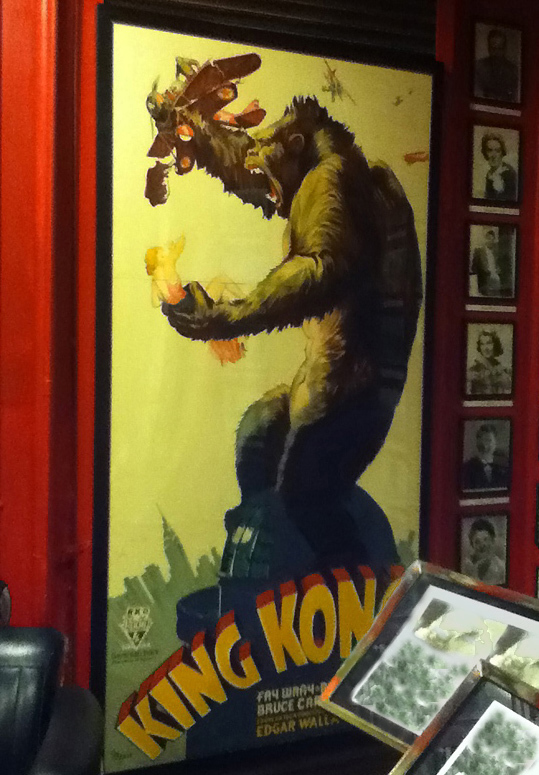 Some of the Dungeon's characters are represented on the second floor, with posters for Dracula's Daughter and King Kong (1933); and there is a larger exhibit for Elvira, featuring costumes, props, and the black Thunderbird she drove in her feature film, Elvira, Mistress of the Dark (which screens on a monitor in the background). Also on view are a tribute to director James Whale (Frankenstein) and a small display for the Harry Potter franchise. If you are interested in film technology and special effects, you will find some interesting camera equipment, including a matte stand made by two-time Oscar-winner Albert Whitlock, which was used to hold a glass plane in front of the camera lens, upon which the effects artist could paint details that would appear to be part of the set or location. Whitlock supplied this type of special effect for numerous science fiction, fantasy, and horror movies and television shows, including Gene Roddenberry's Star Trek, Alfred Hitchcock's The Bird's, John Carpenter's The Thing, and David Lynch's Dune. We were pleased to find some small measure of Geek Appeal in the depths of the Hollywood Museum, which houses not only high-profile horrors but also a few obscure cult items. We question some of the editorial decisions (the list of scream queens included some recent actresses whose credits are not particularly impressive), but we have to balance that against the museum's inclusion of Udo Keir's as the Count in the campy cult film Blood for Dracula. Though there is nothing overtly scary about the Dungeon (no actors in costume, not even an occasional mechanical effect or scary sound), the atmosphere is perfectly attuned for the grotesque nature of its exhibits, and the setting feels less like a museum than like a very well crafted Halloween haunt. Horror movie fans will enjoy a descent into its subterranean recesses, and they can bring along their non-fanatical friends, who should enjoy the rest of the museum. The Halloween-themed Monsters, Mummies & Mayhem: Your Worst Nightmares Come to Life officially closes on November 19, but the Dungeon, along with most of its exhibits, is open year-round, making it the perfect place to get your horror fix during the long wait till next October. We recommend setting aside at least an hour for your trip. You could rush through in less than that, but you will overlook details you should stop to savor, while absorbing the eldritch atmosphere. In an area frequented by tourists, parking can be difficult on busy weekends, but the Hollywood Museum is located next door to Mel's Dinner, so finding a place to eat is no problem - assuming you still have an appetite after walking through the domain of Hannibal the Cannibal. The Hollywood Museum is located at 1660 North Highland Avenue in Hollywood, 90028. Hours are 10am to 5pm, Wednesday through Sunday. Prices are $5 for children 5 and under; $12 for students and for seniors over 65; and $15 for adults. Tickets may be purchased at the door or through the museum's website.